Italian quiches. Crustless… Italian quiches. Can it even be a quiche without the crust? Yes. I’ve always found the crust on a quiche to be so dry that it’s difficult to swallow. So I made these quiches sans the crust and they are fricken amazing! Plus they are super healthy and only made from plant foods. These quiches are made with chickpea flour. The chickpea flour acts as a great binder, so you can substitute or add whichever vegetables you would like to these. I chose to make them Italian inspired, because I was in the mood for salty olives, tangy sundried tomatoes and fresh basil. Flavouring the chickpea ‘batter’ with salt, herbs and nutritional yeast is also important as it delivers almost a cheesy flavour you would expect from a quiche. And I like to be generous with the fresh basil and pepper in these babies. 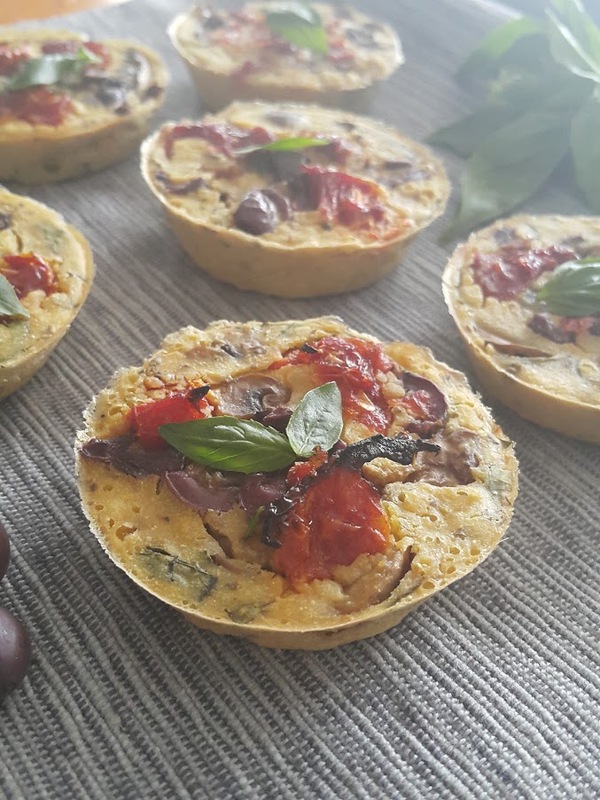 Having one or two of these mini crustless Italian quiches as snack is great for curbing a hunger between meals, or for when you need a grab-and-go style item. As for using them as a main dish, I would serve it with a large salad. These quiches can easily be brought to a party as well and served along with other finger food as they keep very well. For storage, they just go in the fridge or freezer, and reheat them in the oven or microwave before eating. 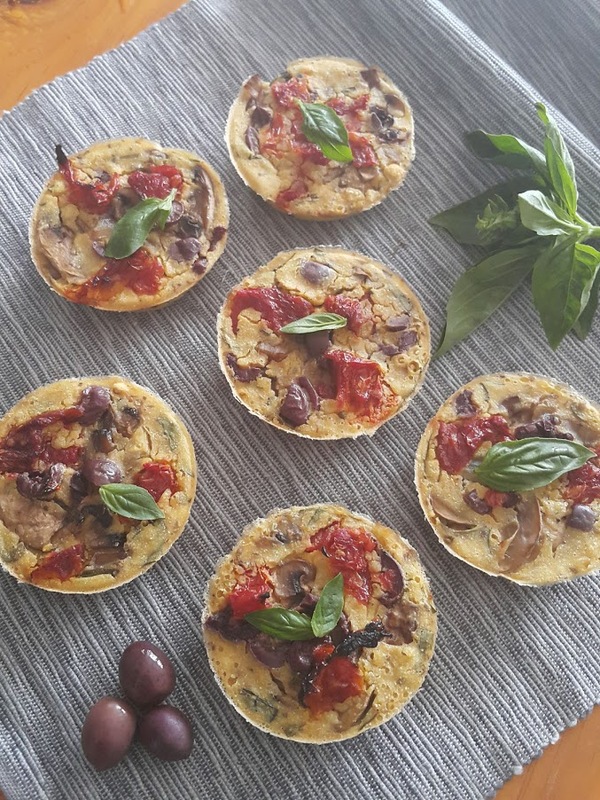 If you make these Italian quiches, and share them on Instagram, remember to tag me @opensauce.cpt + #opensauce, I would love to see your creations! 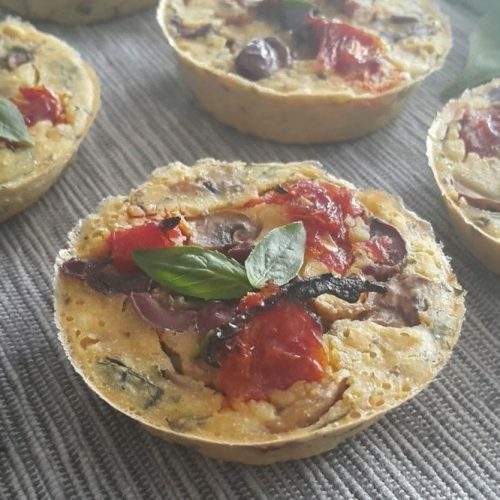 These Mini Crustless Italian Quiches are naturally gluten free and made from chickpea flour. They are packed with the delicious flavours of olives, mushrooms, sundried tomatoes and basil. Perfect for a snack, as a meal with a salad, or to bring to a party. Pre-heat the oven to 200 °C. Dice and prepare all the ingredients. In a non stick pan, fry the onions until translucent. Then add the mushrooms and cook until all the water has evaporated. Then add the soy sauce, cook until no liquid remains in the pan. Remove the pan from the heat. Mix the chickpea flour, salt, pepper, nutritional yeast and dried oregano together in a bowl. Add the water and mix until all the lumps are gone. Then add the basil to the mixture. The mixture should be very runny. Spray the muffin tin with a non stick spray, or use a silicone muffin tray. Scoop 1/4 cup of the wet mixture into each of the muffin wells and then add the mushrooms, olives and sundried tomatoes to each well. I like to do each filling individually so I know they are evenly distributed between all the quiches. Bake in the oven for about 20 minutes. Allow them to cool in the muffin trays for about 5 to 10 minutes before taking them out to cool completely on a cooling rack, otherwise they will sweat. A classic green smoothie is hard to beat. So this recipe really should be a staple in your home. It is creamy and delicious, packed with all the goodness you need to kick off a sunny day. Using bananas as the base for your smoothie adds bulk and guarantees creaminess. I really love the addition of barley grass juice powder to my smoothies because it gives it the obvious green colour, but more importantly it is absolutely packed with nutrients. Because it is a powder made from the juice of barley grass, the taste is very subtle. If you are struggling with the taste or fiber from baby spinach or kale in your smoothies I would highly recommend giving barley grass juice powder a try in you classic green smoothie. (I like this brand). 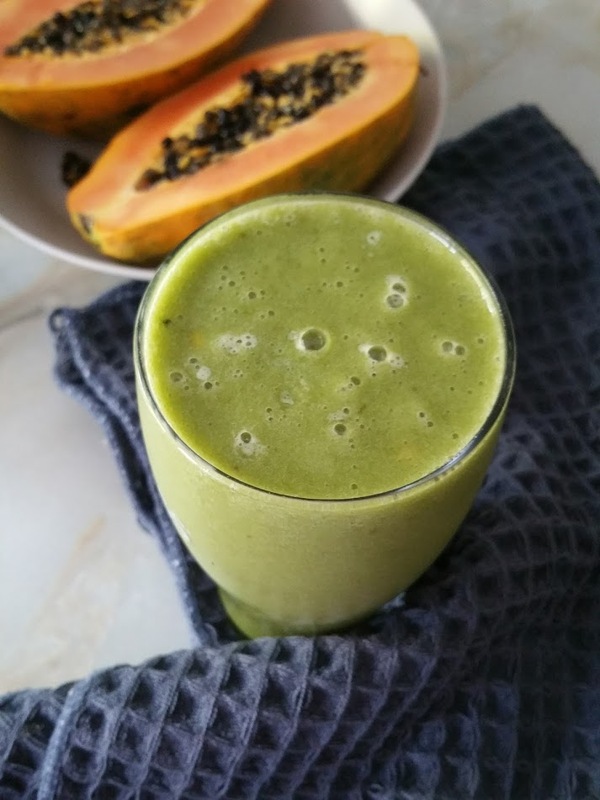 The addition of orange and kiwi just gives it a slight depth of flavour I enjoy very much and gives it an extra boost of vitamin C. And chia seeds are there for the much needed overt fats and omega 3. If you struggle to stay satiated from smoothies, try adding chia seeds or ground flax seeds to your smoothies. Feel free to add or remove any ingredients. After all, smoothies are very versatile. Dates are great to add for extra sweetness if that is what you prefer. This is a classic green smoothie that should be a staple in your home. It is creamy and delicious; an all round nutritious and satisfying meal. 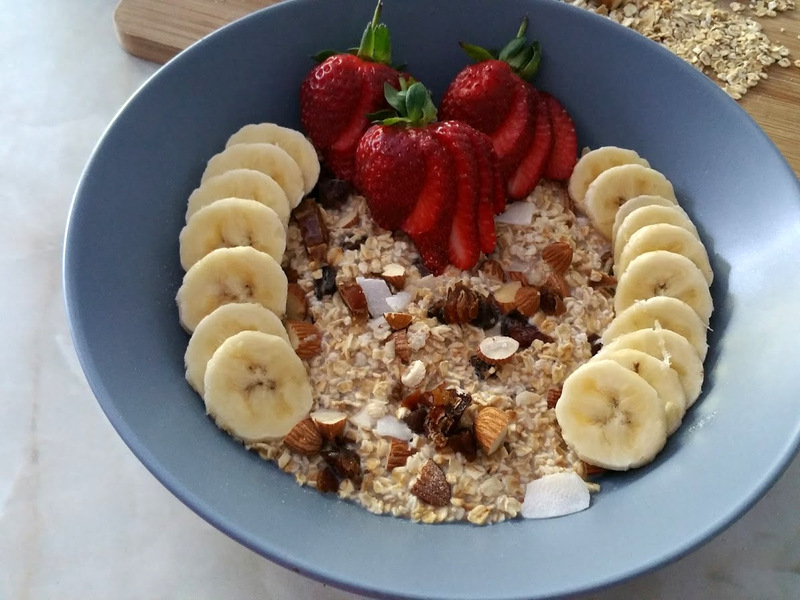 Muesli is a wonderful breakfast option to have, because it is delicious, nutrient dense and should keep you satiated for a long time, especially when paired with extra fats from nuts and seeds. 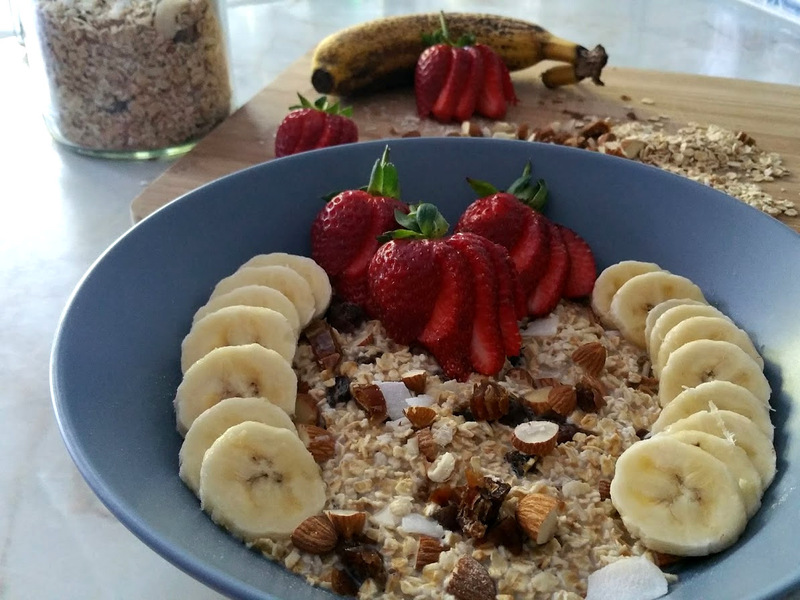 Make your own healthy vegan muesli as opposed to buying already prepared muesli or granola, because it enables you to control the ingredients. 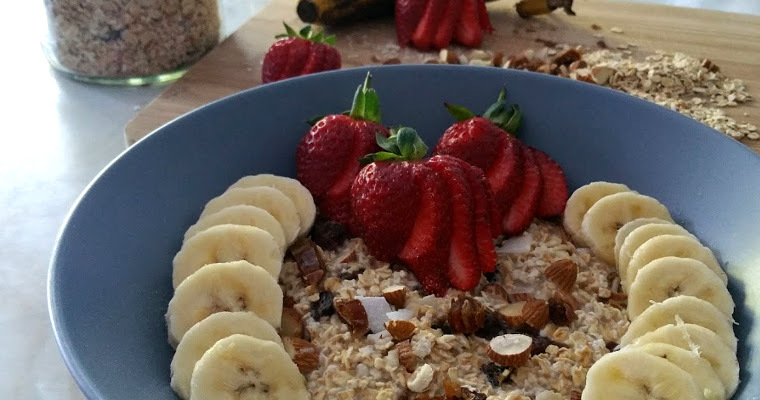 The great thing about muesli is that you can add whatever you like to it. So every week your muesli can be different. Or the same. I like to keep mine simple, so I can still mix it up with an extra topping in the morning. 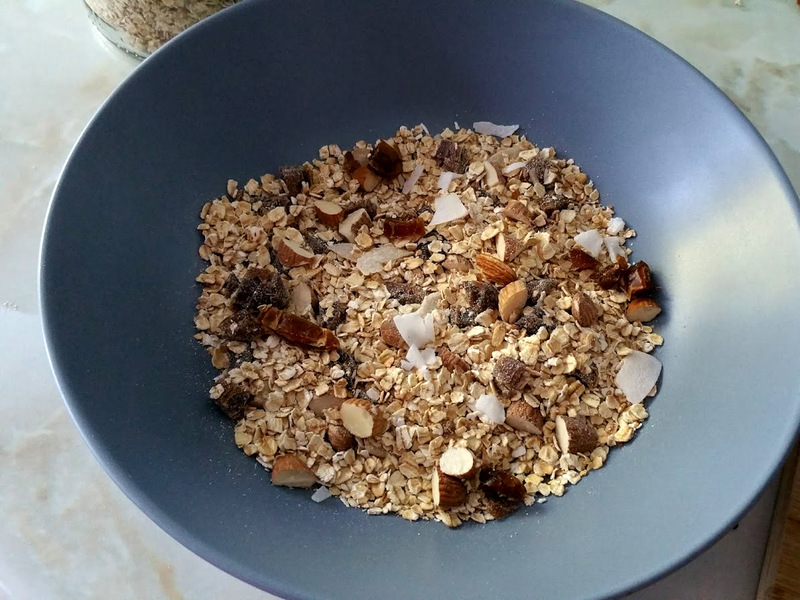 So this is an example of a basic muesli you can make by lightly toasting the oats and adding nuts and something naturally sweet like semi dried dates. I also like adding coconut chips because it adds to the variety of textures and more healthy fats. My preference is to eat muesli with plant based milk (soy) topped with fresh fruit. I almost always use a banana and this time I had fresh strawberries too. You have to make the most of this precious time with strawberries before they go out of season again. 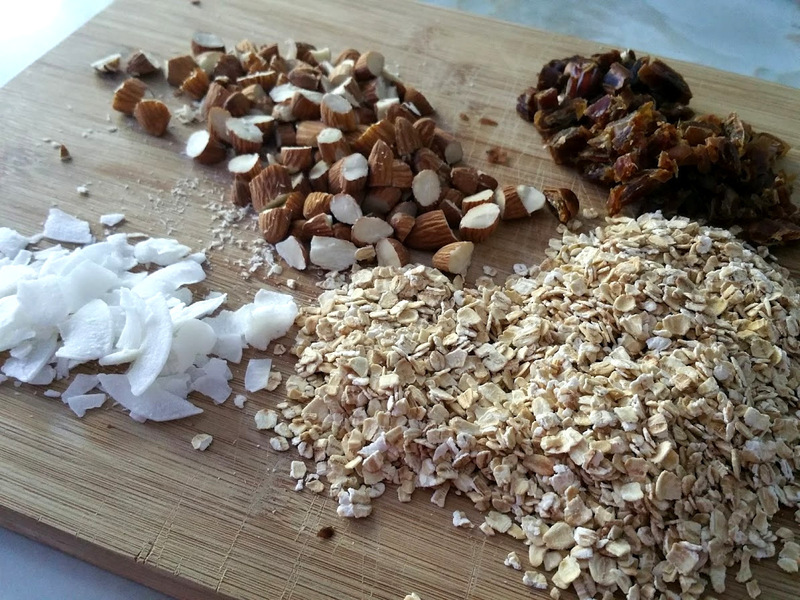 Make your own muesli for the week. Simple and quick and no junk ingredients! Pre-heat your oven to 180°C. Spread 2 cups of old fashioned oats onto a baking tray lined with parchment paper. Place the tray in the oven for 10 mins once preheated. While the oats toast in the oven, chop the dates and almonds into smaller pieces. Take the oats out of the oven after 10 minutes and let it cool completely. Once it is cooled, combine all the ingredients into a reusable glass/plastic container and shake. And there you go! Enjoy with fresh fruit and plant based milk or yoghurt.